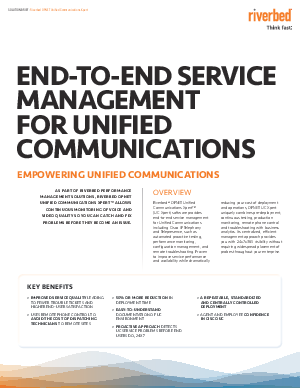 Riverbed® OPNET Unified Communications Xpert™ (UC Xpert) software provides end-to-end service management for Unified Communications including Cisco IP Telephony and Telepresence, such as automated proactive testing, performance monitoring, configuration management, and remote troubleshooting. Proven to improve service performance and availability while dramatically reducing your cost of deployment and operations, OPNET UC Xpert uniquely combines pre-deployment, continuous testing, production monitoring, remote phone control and troubleshooting with business analytics. Its centralized, efficient management approach provides you with 24x7x365 visibility without requiring widespread placement of probes throughout your enterprise. Download here to lean more!